"Our Bass Pro Shops Chevrolet Camaro ZL1 ran really well today in the Clash, and I'm happy with a sixth-place finish, but I was really hoping for more side-by-side racing. The top lane was very dominant. I felt like my car was faster than some of the guys I was around, but you can't really do anything with it unless you get really aggressive. I tried to get aggressive and no one was wanting to work. Everybody got to the top and it was really about track position. It was definitely hard to make a move. At the end of the race, we were involved in the big wreck but, luckily, the Bass Pro Shops Chevy was still drive-able even though it had damage on all sides. When the wreck happened in front of me, I just tried to hold the wheel straight and punch a hole. I tried to slow down, but you can't stop when you're going 200 mph. It's a hard thing to do. For the Daytona 500, I think the racing will be better with 40 cars in the field. It will be good to have a car that handles well because so many things happen during a 500-mile race. You can get track position other ways than just racing, so we will do our job. 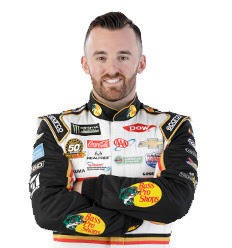 I'm proud of RCR today. All of our cars had speed."